Dave Holmes, Life in Swimming. Armthorpe SC to a Swimming Scholarship with Binghamton University. Every now and again, someone pops up out of the deep end and writes an article for the website. Sometimes these are former Dartes swimmers with happy memories to share. Often they're current members with something special or interesting to shout about. Either way, if it's interesting and in some way connected to Dartes or Doncaster Swimming, we'll probably publish it. Here's one of those articles. "Oh really, I used to be pretty good at swimming too, we'll have to have a race one day." Which generally means they splashed around in public sessions a bit as a kid, or maybe won their school's swimming championships. Either way, a race would be highly embarrassing. So when Dave gave Andy a very similar line that day, you know exactly what Andy was thinking. Then a few months later, Dave made an appearance at the Mets! I remember the confused look on Andy's face as he checked out the entry time for his Basketball team mate after bumping into him on deck. I'll never forget how that look changed when the unbelievable entry time was actually beaten! Struggling to come up with an adequate introduction to the swimming life story of Dave Holmes, I came across the following quote from Pipe Dream, the student newspaper from his Alma Mater Binghamton University. Hopefully it will give a few clues as to what follows. 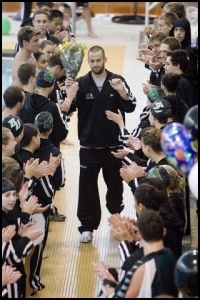 Freshman Brenno Varanda had a breakout performance for the Binghamton men's swimming team this season. The engineering student from Sao Paulo, Brazil, won four events and had two second-place finishes at the America East Championships, helping the Bearcats snag second place in the competition. Pipe Dream's Anna Komor caught up with the freshman phenom during practice. AK: Do you have any swimming role models? BV: The one that's struck me is my teammate Dave Holmes. I don't know how to say it in words, but he blew me away with crossing over the limit with swimming. He put another perspective on how a person is towards you, how a person is personality-wise outside the water and how a person swims in the water. He is completely different from what you would expect of somebody so fast. You expect somebody fast to be bigheaded, cocky and a person you're afraid to talk to. When you're talking to Dave, he's just another teammate and you'd never know he's a scholarship swimmer." After being asked to provide a commentary on my swimming career earlier this month for the DARTES web site I found myself becoming quite reflective and it really hit home how much of an affect swimming had in shaping my life from around the age of 4 years old right up to the present day. I learnt to swim at a small teaching school in Bircotes, just outside of Doncaster around age 3. I went this early because I wanted to be like my older brother who was already having lessons. Although the club did have its own club championships, they did not swim in competitive galas and had very few swimmers older than 10 or 11. After a few years of swimming there, a move to a competitive club was on the cards. Doncaster ASC, based at St. James Street, was the first club I joined and where I had my first taste of swimming galas but it was not too long before my brother and I yearned more competition and training as we both began to find that we had a real nack for the sport. So the next step up was to one of Doncaster's largest clubs, Armthorpe. Swimming for the Kingfishers in league galas and the METs was my first introduction to the next level of competitive swimming and I loved it. I was still managing to play plenty of other sports at the time - including basketball, rugby and football and I strongly believe all those sports had a massively positive impact on my swimming career and life in general. They not only helped condition me physically but also showed me that my real talent was swimming and not really the other sports, so over the next 5 years, one by one they fell be the wayside. After joining DARTES around age 12, I saw a piece of paper on the notice board that said "Yorkshire Championships Qualifying Times". I saw that as a challenge and set about trying to make the times. That was pretty much the first challenge I set myself. The next was to make the finals at Yorkshires. Then it was to make the finals at North Eastern's, then make the finals at Nationals. At this time DARTES had a very strong and nationally recognised squad. In the age group above me (my brother's age group) we had several national medalists, so I had something close to home to aspire to. I think goal setting is something every swimmer needs to do - set short and long-term achievable goals. These small progressive steps were also a vital part in building confidence as a swimmer. When I made my first National Age group finals in 1997 I set myself the target of getting a medal or two the following year. I had also decided that this would be a make or break year for me and if I missed my goals, I would stop swimming altogether, as I had begun to lose motivation and wasn't finding swimming as fun or rewarding as it used to be. Looking back on the situation I think this had something to do with how in the past there had always been older, faster swimmers in the lanes at training so it was easy to see where your progression was taking you. Now I was in the top lane as one of the oldest swimmers there and I couldn't see where I would go next. Anyway, I missed my National gold medal by 0.5s in 1998 and didn't return to training the following September. I continued to swim the occasional league gala for Armthorpe but didn't get in the pool to train in any serious capacity. Therefore, when I started university in Derby in 2002 I joined the local masters swimming club. I swam 3 or 4 times a week depending on uni work and began to get the hunger for competitions again. Because I was swimming with the masters section of the City of Derby SC the head coach, Svetli Tomov did not know me. So when I showed up on poolside for the County Championships he was a little miffed - I'm sure he thought I was a parent! Nevertheless, after that weekend, we chatted and he introduced me to his star swimmers - Ross Davenport and Dean Milwain (currently both members of Team GB) and said it would be good to get us all in the same training squad and try to make something 'special' happen. Unfortunately, a couple of sessions after this conversation Ross decided to go to Bath University full time and Dean was selected to swim at British Swimming's offshore center in Australia. So Svetli and I worked together and we took a trip to Senior Nationals later that year (2003). Svetli had an ability to instill confidence into his swimmers, to get the best out of them in training and more importantly in races. I think it was in part due to his coaching style of almost turning the swimmer into their own coach. After every race he would have me tell him what splits I had done for each 25 (without looking at a stopwatch) and he would ask how each one felt. By doing this learning how to pace races and set target times became a lot easier. He had a massive impression on me and shared my desire to win. The next year, through a random chain of events, Svetli got me talking to a college in the USA. This university offered me just over $20,000 per year in scholarship to come and swim for them. Seeing as going to university just outside New York City for free was a much better option than building up debt and going to Derby, I packed my bags and a couple of months later I was living in the USA. The swimming opportunities were also VASTLY superior. Much like DARTES, the City of Derby swam in some Council owned facilities and not only have to pay for all their pool time, but they have to take sessions that will minimise the affect on public swimming sessions. Not the case when your swim team owns the pool! We had first say on when we wanted to train or on what days we wanted to hold galas or training camps for local children. Binghamton University was now my new team and I was really excited. I urge you to take a look at their website for athletics and just look at the facilities I got to use every day, for free. I am not over exaggerating when I say they are better than the sports facilities in most small towns in England. 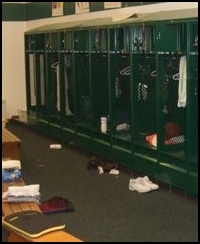 Each team had their own locker room with each team member having their own BIG locker so we didn’t have to carry our swimming kit around (we all got the kit for free too). Our $31 million Events Centre housed the 2500 seat basketball area, 6 indoor tennis courts, running track, athlete only weight room, sports science and treatment rooms as well as all the coaches' and administrators' offices. See the website for all the other facilities! I was trying to go from swimming 4 times a week with no land training, to swimming 20 hours a week over 9 sessions along with a strict weight lifting schedule and it was horrible. Not only could I hardly ever complete a training session, but I didn’t even look like a swimmer. The other guys were in far better swimming shape than me and were coping well with the high yardage workouts. So catching them up was the goal my coach and I set up at the beginning of the season. The other side of swimming, racing, was always where the fun was, so I was very happy that we swam a gala every week. Racing is something you cannot replicate in training. 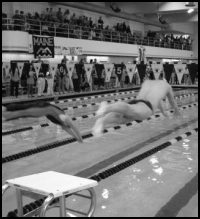 That adrenaline rush before stepping up on the blocks is one of the better things in life and is one of the things I miss the most now that I don’t swim. The structure of the team, the work we put in each week and the support services in place for the swimmers (such as a team dietitian, dedicated team physios and a strength and conditioning coach) gave me a massive boost psychologically and played a big part in improving my mental toughness. I began to see galas as being the place to put on a show and have fun. Because of the Turkish superstar on our team we got a lot of press coverage and we would regularly have 200 or so people come to our galas. This made the atmosphere electric and you could feel the chants and stomping feet of the crowd when you were in a close race. The mental side of race preparation was also something that the coaching staff in Binghamton approached quite seriously, as did the rest of the team. We knew that if we worked harder than our peers, at the end of the year we would be in a great position to beat them. Michael Phelps' coach Bob Bowman described this philosophy best in one of his post Beijing interviews. He said that each good meter done in training is like putting money in the bank. Every day you put a little more in then at the end of the season for one big gala, you rest up, shave down, put on a fast suit and make a big withdrawal from the bank. That was our whole teams' thinking every year. Each person had their own little way of reminding themselves of their goals. For me this meant keeping a list of all the people who had ever beaten me in a race while I was in the USA next to my laptop in my bedroom. I also wrote down the date of our championship meet on my kick board as a motivator during the numerous and very painful kicking sets we did every week. The other great motivators were my teammates. There was always someone on your case about putting in the right amount of effort and not slacking off - I got a lot of abuse in my first year! On the 2nd of January each year we all met at the pool on campus, jumped on a coach and went to the local airport. There we flew down to Florida where we would stay for a week for our intensive training course. We swam morning and afternoon every day in a beautiful 50m outdoor pool and I can honestly say I had never felt so drained in all my life. That week each year was very painful. Being in Florida, in the sun made it a little easier however! But for us that marked the peak in our training for the year. A couple of weeks after the training trip the sprinters (including myself) would begin their 3 week taper for the championship gala in early February. I approached swimming in the USA in just the same way I had as an age grouper back home. I set a goal of getting medals at our conference championships in my first year. Then the second year I wanted to win all my events at Conference level and get Consideration Times for the NCAA (National Collegiate Athletic Association) championships. Then in my third year, I wanted to go to Nationals. 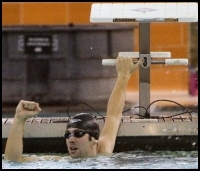 NCAA swimming is a breading ground for many, many Olympic swimmers. It was a great experience to swim against athletes who totally blew my mind with what they were able to do in the water. I saw a man swim 50 yards (2 lengths of Hall Cross pool) in 18.46 seconds and then later the next day swim 100 yards in just over 40 seconds. Coincidently, that same man swam 50m freestyle in the Olympics the next year, and won. 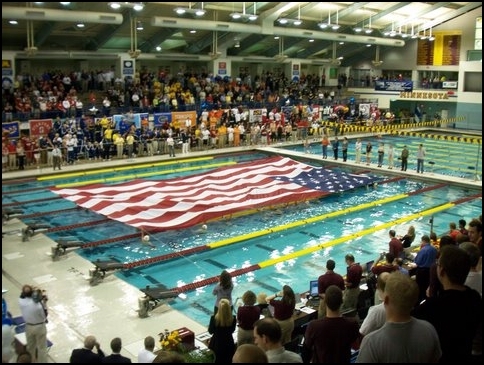 As a swimming fan, NCAA’s was the highlight of my life, but as a swimmer, it was quite a low point. I had spent 3 years training with my team, day in, day out. We all pushed each other to our own individual goals and shared in each other’s success. Going to NCAA's was something that I did alone. It was a 4-hour flight from our university to Minnesota, where the NCAA’s were held, and because I was the only member of our team to make the cuts, only my coaches could join me. My point is that swimming is technically an individual sport, but the friends and teammates around you are the ones who make it worthwhile. Recently Dave Cuthbert wrote about how swimming friends are lifelong friends. I echo his sentiments. I rarely talk to my classmates from school or Derby uni, but I catch up with my teammates all the time. I was brought up to believe that you should have some element of fun in whatever you do. I rarely enjoyed the pain in my shoulders during training, or the miles of kicking we did in the USA and I certainly never enjoyed shoveling snow off the car at 5am to make it to morning training. But I had more than a little fun during those few seconds between sets when the team joker comes out with a classic one-liner and for a while the laughter takes away from the aching in your muscles. The more good training you do, the more fun racing will ultimately be. Swimming has given me some amazing opportunities, not least living in another country for three years and a free college education. I have kept in touch with a lot of people whom I met through the years and no doubt will do so for the rest of my life. Swimming is a great sport, it can be hard, but should always provide you with some fun somewhere. For me that fun was had by swimming fast and racing people.